For this Sled, you need four 30cm (12") bamboo BBQ skewers. Also, you need to cut off 2 short 0.3SL (8.7cm, 3 1/2") lengths of skewer. The photos show how these are all glued together. Both pairs of skewers are lined up straight, flat against the table top. These are the vertical spars. Well, almost vertical when this kite is ready to fly! To make sure there are no kinks at the joins, get your head down low and look along the skewers. Shift one a little, if necessary, before the glue dries. Snip off one point from each spar. Line this end up with a top corner of the kite sail, with the pointed end of the spar crossing the corresponding bottom corner of the sail. For both spars, attach the bamboo to the plastic with insulation tape, as in the photo up there. At the bottom corners of the sail, snip the skewers to length so they are flush with the edge of the sail. Attach each bottom tip to the plastic in the same way as the top tips. These are the (nearly) vertical spars. All the construction details for the bridle are contained in the large photos below. 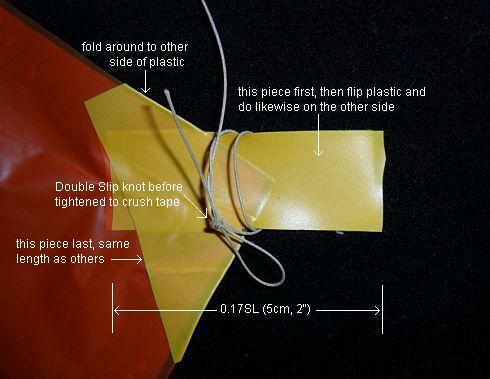 For a Sled kite, this is rather simple and straightforward. Just use 20 or 30 pound flying line for the bridle loop. 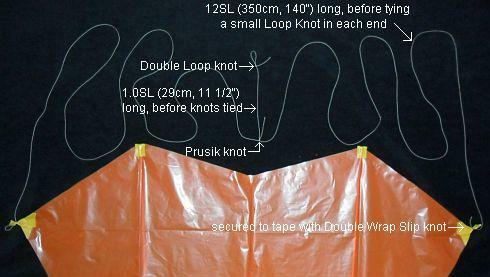 Lay the kite on the floor, with the 2 spars touching each other along their entire lengths. Stretch out the bridle, unlock the Prusik knot and slide it along until both lines are exactly the same length. Then lock the Prusik knot again. At this point, you've finished making the 2-Skewer Sled! 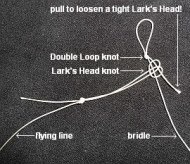 To attach the flying line, just Lark's Head the flying line to the short bridle line as in the photo.